For three days in March, Oliver Lake visited Sampsonia Way on Pittsburgh’s North Side where City of Asylum/Pittsburgh has a row of houses for writers in exile adorned with original artwork. Lake has traveled to Pittsburgh for five consecutive years to participate in COA/P’s annual Jazz Poetry festival. However, this time Lake was here as a painter, preparing to design the Oliver House, a yellow and blue house on the alley that will soon be covered inside and outside by murals and ornaments of his design. In this interview with the well-known composer, saxophonist, flautist, and bandleader, he discusses many of the other disciplines he is involved in, particularly painting. Just as he improvises with his sax on the stage, in this conversation he answers fast and precisely. Even though most of people know you as a musician, you are an accomplished poet, painter, and performance artist. When did you start combining these activities? My background goes back to The Saint Louis Black Artists’ Group. That was in 1968. There were musicians, poets, dancers, actors, and visual artists. I always think about it as my school. I primarily consider myself a musician and a composer, but working there with the poets I was inspired to start writing my own poetry; after watching the visual artists, I started to painting. When I moved to New York (in the mid-1970s) I was doing one painting a year. But about five years ago I started to spend more time in painting. Why did you change your routine five years ago? It was the inspiration of a friend of mine. I told him that I wanted to paint more, but I didn’t have time. And he asked me if I had 15 minutes by day. I said, “Yes I have 15 minutes.” He said, “Well, you can start painting”. So you started by painting everyday for 15 minutes? Everyday I painted for 15 minutes, and then I did it for 30 minutes. After a year I had enough work to do a show. My friend made me realize that I shouldn’t have stop because I didn’t have lots of time. Now, I do it maybe an hour a day. Some days when I’m writing music, rehearsing, or travelling—I still travel a lot—I can’t make an hour, but I always try to make time. Put All My Food On the Same Plate! You also make unique painted-sticks, which were exhibited at the Montclair Art Museum. Where did the idea of the sticks comes from? They started out just as walking sticks. My family and I used to go to camping every year and we would grab some sticks and paint them. Then I did it with my kids. Now I have a whole wall of them with different names: talking sticks or life sticks, for example. In fact, nobody uses them as walking sticks anymore; people who have purchased them purchase them as pieces of art. affect each other sometimes? Are there times you really want to be writing poems and you are playing music? No. Everything is everything. I don’t feel like I missing anything when I’m doing a certain thing. If I’m writing poetry or I’m painting, I’m doing that. My priority is music—to play the saxophone and to compose for the various groups I’m in. The painting started as a hobby and, as the time has gone on, I have been able to participate in some shows. And this project with City of Asylum—the Oliver House—is the biggest project that I ever had. How did you react when City of Asylum asked you to collaborate with them and design the Oliver House? It was a big surprise and I was really excited about it. I’m always a person who likes to jump to things I never done before. When they spoke about painting the house, and about having an “Oliver House” with my signature, I was very excited: I’m looking forward to starting it. As you see, I started to make some sketches to get ideas of how the final design will be. 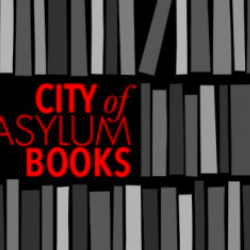 Let’s talk about your relationship with City of Asylum. Tell me about how you became involved in City of Asylum/Pittsburgh’s Jazz Poetry Festival in 2005. I had an agent, who actually was the one in touch with Henry Reese (Director of City of Asylum/Pittsburgh). Henry called him looking for another musician, and my agent told him that I was a better choice for his project because I did poetry and I have worked with poets. So it was a kind of serendipity to be here. When I talked with Henry, he mentioned the fact that I would be working with Huang Xiang, a Chinese poet who didn’t speak English. That became my first reason to do it. Now, we have done six years of this in collaboration with bands in which I play. I came as a soloist the first time, and then I came with the World Saxophone Quartet, then with Trio 3 and Gerri Allen, our special guest last year. And this year I’ll bring my 17-piece big band. So the relation continues to grow each year and this is exciting for me. 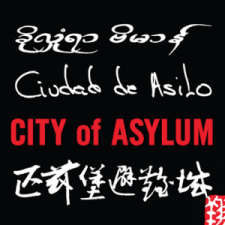 In the City of Asylum’s Jazz Poetry Concerts, you have improvised music for writers from around the world. What does this particular experience mean to you? City of Asylum is very unique in how they deal with exiled writers. Working with the poets who are speaking in foreign languages and trying to make my music compatible with what they are saying—even though I don’t understand them—is another challenge for me. I’m very happy that Henry has asked me to do the composition and work with the poets in the last five or six years. Your performance with these poets and your work with many bands evinces your ability to collaborate, a unique skill. How did you develop this ability? Well, I go back again to talking about the group I mentioned before, The Saint Louis Black Artists’ Group. And I have been working with World Saxophone for over 35 years and with Trio 3 for over 22 years. Both of them are cooperative groups and in order to be part of these groups, you have to being able to cooperate and communicate with each other on the stage and off the stage. That is a kind of work I have been doing all of my career and I’m always have been level-headed with my musicians and friends through all my life. That, I think, is part of my personality. I saw you in some rehearsals and one thing impressed me so much is your humility. Your focus was on the work and enjoying the collaboration rather than on being the center of the performance. How did your life experiences inform your humility? All the experiences I had made me who I’m. But in terms of humility, I never thought about myself in that way, but now you say it, maybe being humble is crucial when you are working with bands and cooperating with musicians. I think that another aspect that helps me to work with the group is self-confidence. WATCH LAKE READ HIS POEM: DO YOU REMEMBER THE TIME?